An award-winning Dunedin junior doctor Hong Sheng Chiong has produced a world first smartphone diagnostic kit which will help diagnose people who may have sight-threatening illnesses. The invention is one in the eye for blindness as the free app thinks it’s an eye doctor. His medical company, oDocs Eye Care, has created the app-kit that performs a similar function to $50,000 worth of eye examination equipment. View a video clip about the device here: www.odocs-tech.com. Last year Hong took out the top award at the Health Institute New Zealand’s Clinicians’ Challenge, winning the active project development category for his oDocs Eye Care initiative which uses mobile technology to increase access to ophthalmic care. He also won the New Zealand Innovators Awards 2015 People’s Choice Award. 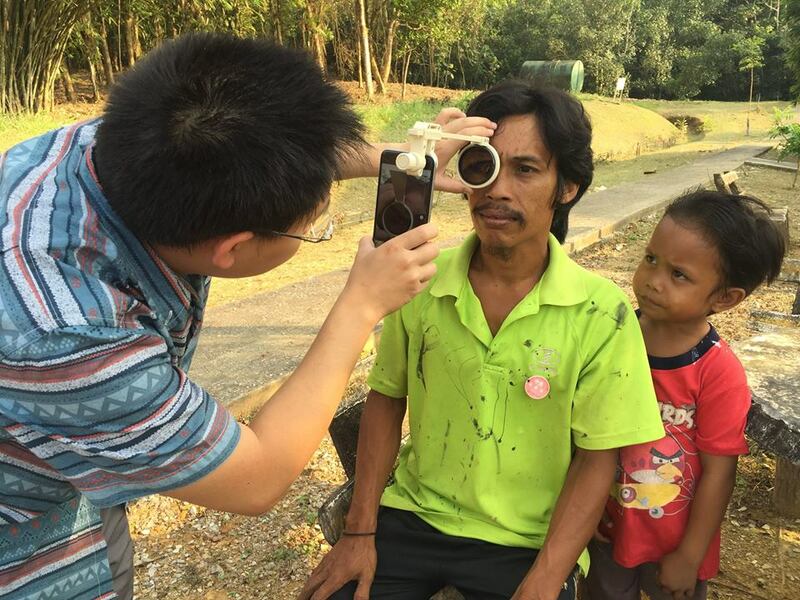 Borneo-born Dr Hong says emergency eye care diagnosis can be slow, unresponsive and expensive. oDocs has created a portable eye care kit that uses a 3D printer and a smartphone to create ocular imaging adaptors that take pictures of the eye and retina. “There are other kits on the market that perform similar functions to the direct ophthalmoscope and are smart phone enabled, but they do not offer the same level of optics nor are they as affordable as our kit. “With oDocs’ proprietary smartphone app and revolutionary attachments, doctors can diagnose sight-threatening illnesses anywhere in the world. We have sold 200 units around the world and the open-source product was downloaded by over 2000 people in countries such as the United States, Indonesia, Mexico, Egypt, India, Pakistan, Philippines, South Africa, Nigeria and Britain. “We have received a small grant from Callaghan Innovation and $20,000 from the New Zealand Blind Foundation. The rest we have self-financed among the founding members and contributors”. Earlier, Hong found in Malaysia, Kenya and Nepal high rates of preventable blindness. In developed nations, we take the equipment for granted. But traditional ophthalmic equipment is often bulky and hard to transport to people in remote communities. People are trying their best to care for the patient but they just don’t have the right tools. Dr Hong and his team developed the prototype smartphone app and an open-sourced 3D printable attachment that enabled doctors to easily view and photograph the back of the eye. oDocs has just released the commercial version – the visoScope. This device completely replaces the conventional direct ophthalmoscope and retinal camera used by eye doctors to diagnose retinal conditions such as glaucoma and macular degeneration. Retinal cameras typically cost around $US20,000 USD. His visoScope device is going on the market in New Zealand this week and will be offered at $US249. Preventative eye care also involves examining the front of the eye for diseases like cataracts and corneal conditions. oDocs will also release a new adapter called visoClip that performs a similar function to the slit lamp microscope, another device worth $15,000 USD. visoClip will be sold for $150 USD and is about the size of a two-dollar coin. oDocs is going out to the New Zealand medical community to support this project, chief executive Hanna Eastvold-Edwins. She says mobile technology offers an exciting way forward for the medical industry.